False eyelashes are becoming more and more popular everywhere. In fact, in Hollywood it is more uncommon to see a celebrity not wearing them. Although these peeper poppers have been around for a long time, their popularity has only emanated within the last couple of years and though there are many ladies wearing them, perfecting their application is yet to be desired for some. Here are some tips for applying false lashes so that they will last all day long. The most important step in applying your lashes is finding the right set for you. There are many different brands, styles, lengths, colours and glues out there that will help create the perfect look. For some it is trial and error with what looks best for them. All in all, it is essential that you find a set of lashes that fits your eye. For those who have smaller set eyes, this can present as more of a challenge since many of the lashes out there are created for larger eyes. False lashes should be placed after you have already applied your eye shadow and liner. Apply a thin layer of mascara to your eyelashes. You may also curl them if you choose to. Remove your falsies from the package and bend them back and forth to create some flexibility. This will help you place them on your lash line easily without the ends lifting off. Keep bending them back and forth for about 30 seconds each. Place a thin layer of glue (dark coloured adhesives are best) from end to end on the lash and let it dry for about 30 seconds before putting it on your lash line. Place the falsies directly on your lash line with your fingers or tweezers as close to your lashes as possible, keeping them close to your inner tear duct. Gently pat down the ends of the falsies to help the glue stick and gradually move along the lash line until the glue dries. Touch up your liner, or eye shadow if needed. You may put a layer of waterproof liquid or gel liner over the lash line to hide any visible glue. You can also apply mascara to the falsies to give a more dramatic effect. The above steps also apply to individual lash bundles, however, they tend to not look as natural unless you have long eyelashes. When applying individual lashes, you will want to use tweezers to dip them in glue and place them on your lash line in order to align them correctly. 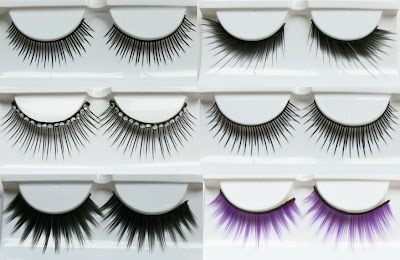 There are also some things you want to avoid when it comes to wearing false lashes. Firstly, you should never cut the length of the lashes themselves. However, some choose to cut them because the set is too wide. It is perfectly acceptable to cut them this way as long as you trim the longer end. The best way to avoid having to do this, is to find a set that fits you without having to make any adjustments. It is also important that you do not apply the lashes to your eyelid. Instead, they should be placed directly on your lash line as low as you can possibly get them. Nothing makes a woman’s eye pop like a good set of false lashes.